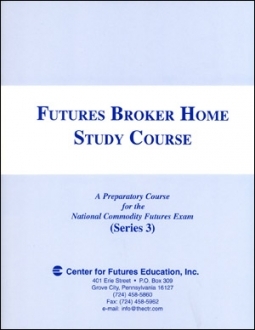 Futures Broker Home Study Course (Series 3). Now in its Twentieth Edition. 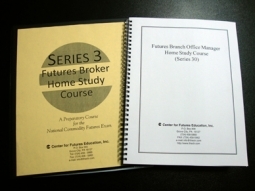 This combo package includes both the print version and the online version for your studying convenience. The Quizzes have expanded answer keys showing calculations and/or page references for answers. In the online version, the quizzes are interactive, giving you immediate feedback. 5 accesses per quiz. 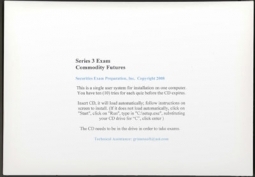 2 final exams are patterned after the NCFE (National Commodity Futures Exam) and each has an expanded answer key. In the online version, after completing an interactive final exam, a list of those questions you missed is presented with your final score. You may choose questions from this list to see the original question, the answer you supplied, the correct answer, and an explanation. 10 accesses combined for the 2 final exams. Economy! Study at home in your spare time. No need to travel, miss work, or pay food and lodging, as with seminars. Also, competitively priced! The online course access is good for 90 days.